WEST VANCOUVER, Canada — It took just one session for Ian Dowdeswell to be hooked. His wife Frances recalled how he woke up one morning in anticipation of his next art class at a local community centre. Ian now takes part in daily activities at Keeping Connected, a staff- and volunteer-run program funded by a mix of fees plus private and community grants at West Vancouver Seniors’ Activity Centre. His participation is a significant change from five years earlier when the Dowdeswells spent most of their time together. They were active and healthy in an effort to slow the progression of Alzheimer’s disease in Ian after he was diagnosed six years ago, but Frances said they were increasingly cut off from other people. It was taking an emotional toll. With an aging population in Canada, loneliness and social isolation among seniors are gaining the attention of every level of government. Eddy Elmer, a gerontology researcher working with the City of Vancouver’s Seniors Advisory Committee, said loneliness can contribute to increased health problems, dementia and even death. There isn’t a clear solution, said Elmer, who is researching the issue as a PhD candidate in gerontology at Vrije Universiteit Amsterdam. Identifying people who are lonely is a challenge, let alone addressing their individual circumstance, such as the loss of a close friend, declining mobility or denial. “Nobody wants to admit feeling lonely because being lonely is so stigmatized, and then to admit that you’re lonely and that you’re old, it’s kind of a double-whammy,” Elmer said. Some people are happy with limited social interaction. But for others, chronic loneliness can significantly harm their well-being, he said, and lead them to develop negative perceptions of relationships, become suspicious of others or push people away, which makes matters worse. The National Seniors Council, established by the federal government to research and report on issues facing seniors, released a report this year looking at seniors at risk of social isolation — those cut off from others but not necessarily lonely. It highlighted a variety of risk factors such as caregiving, mental illness, low-income and living in remote areas, and called for building age-friendly communities with transit and diverse services. The issue isn’t exclusive to seniors living alone in the community. A reportreleased earlier this year by B.C.’s seniors’ advocate found that nearly half of people in long-term care facilities say they don’t have a close friend within the residence, and a quarter say it never feels like home. | Ian and Frances Dowdeswell and Mary Romanko say they’ve come to rely on the programming at the West Vancouver Seniors’ Activity Centre. For the Dowdeswells, the centre became the community they needed, offering a new social circle for Ian that in turn gave Frances more time to herself and also connected her with a support group for caregivers. Ian said there are two major benefits he’s noted from the activities. “One is the exercise and the other again is the camaraderie that sort of evolves as you get to know who everybody is, their idiosyncrasies,” he said. According to Frances, that growth in relationships has given them a sense of belonging that is unmatched compared with any other social programs they’ve encountered in the area. 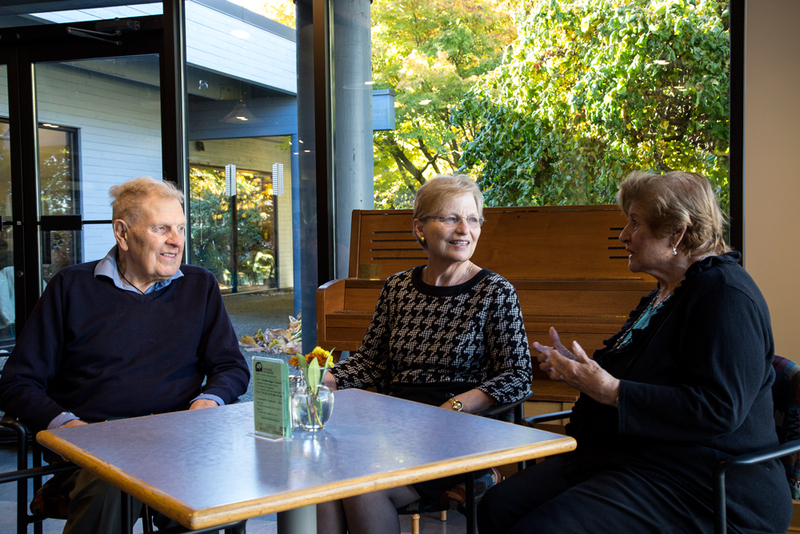 Keeping Connected was launched nine years ago by the West Vancouver Seniors’ Activity Centre with the goal of reconnecting people in the community who were becoming more isolated. It’s specifically designed for people who have experienced a loss, which could be a spouse, physical abilities or mental capacity. The initial handful of activities and 50 participants have slowly ballooned to well over two dozen activities, from exercise to art classes, that draw 500 participants to the centre every week. The activities are well planned — and marketed — with the needs and interests of the community in mind, Vajda said. An exercise class created for women called “Stand Tall” is one of many examples. It appeals to fears of losing good posture with age but without sounding prescriptive. The programs also adapt to the varying physical and cognitive abilities of each participant, challenging those who want it without excluding others. It keeps the barriers for entry low with subsidized fees through government grants and community and private donations and a shuttle service to and from the centre. The relationships fostered at the centre trickle out into participants’ lives. Frances Dowdeswell has made friends she calls or emails to check up on days away from the centre. She and Ian will give more attention to someone when they know they’re going through a hard time or their spouse is away. “It’s a community centre, but it also brings the community together outside of the centre and I think that is really important,” Ian said. The reach of the programming also extends beyond the centre through education and outreach, Vajda said. Volunteers at the centre learn about the challenges of an aging population. Some of them in turn help organize workshops for the general public about dementia and the types of support people living with the condition may need. The success of Keeping Connected hasn’t gone unnoticed. In 2016, it won British Columbia Recreation and Parks Association Program Excellence Award, and Vajda said it’s a model that could be replicated elsewhere. 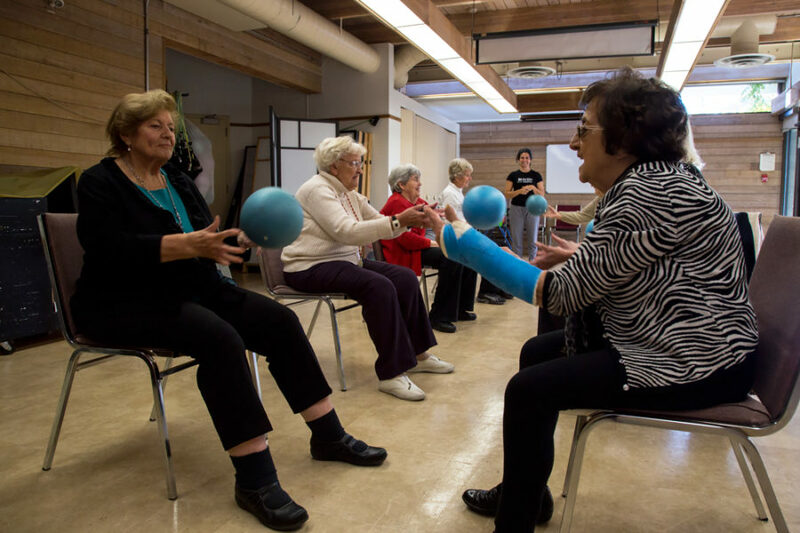 West Vancouver is not the only city trying to get ahead of the challenges of an aging population. The Seniors’ Advisory Committee is working on recommendations for Vancouver city council to consider that would help the issue of social isolation. The committee’s chairperson, Colleen McGuinness, said there’s plenty a city can do, from designing neighbourhoods to improving accessibility of facilities and programs. A report will be presented to council in the coming months, where if accepted, will be passed to staff to determine what is feasible to implement, she said. Some of the recommendations will be shared and encouraged for local non-profits or organizations to adopt. “We have a growing population of seniors so we have to do more to engage them,” she said. Allies in Aging, a three-year pilot project run by a collective of neighbourhood houses and social services and funded by the federal government, is using a range of interventions to better engage seniors across the Lower Mainland. It includes outreach programs through the South Vancouver Neighbourhood House Seniors’ Hub and Burnaby Neighbourhood House, volunteer training at Family Services of the North Shore and transportation through Burnaby Community Services. Mariam Larson, a gerontologist leading the program, said each initiative is tackling potential barriers, including language and affordability, for people to get engaged in their communities. While these programs address specific issues related to loneliness, Larson said there are bigger societal changes that need to happen. The inevitability of loss and loneliness that can come with age isn’t thought about enough, Larson said. Intergenerational relationships that could make losses a bit easier should be encouraged more, but there also needs to be greater acceptance that loneliness is normal, she said. Linda Givetash is a Canadian-South African freelance journalist based in Vancouver, B.C. Her work has appeared in print, digital and broadcast media outlets around the globe. LINDA GIVETASH | 2016 | All rights reserved.